We want to introduce “simon” to you, Austrias first mini power station! In 2014 the austrian utility company “oekostrom AG” wanted to start a power revolution and create a photovoltaic system that everyone could use at their own homes. Their idea came up after the first phase of research, when they found out that the only systems available at that time were exclusively usable for experts. Within only a few months they came up with a whole new concept, that would allow everyone to produce electricity with their own mini power station, called “simon”. After their concept was ready, the inventors new they needed advance bookings in order to set up the production structure for the power station. By starting a Crowdfunding campaign they were able to make sure enough people would be interested in their idea. That was the beginning of the Crowdfunding campaign “simon- The mini power station”, which was launched on the platform 1000×1000.at. In 2015 when “simon” was introduced to the crowd, they were absolutely supporting from the very first moment. They wohle concept was something many people had been waiting for: Genereting electricity by just putting “simon” up on your balcony. Of course the mini-power station could only create power in small amouts. More precisely, it would allow you to create elecricity for 35 cups of coffee, or two meals, every day. But that was not the convincing argument for most investors. “Simon” was the first high quality product of its kind. It was the very first austrian high quality and regional produced eye-catcher for your balcony, that would allow you to generate your own electricity. 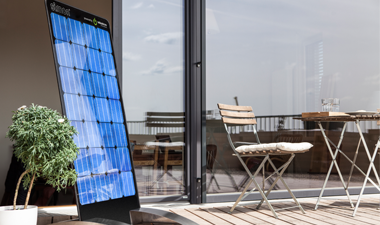 People would appreciate simon as a useful accessory for their balcony that is also a symbol for caring about environmental issues, as it generates power with a photovoltaic system. That concept convinced almost 1000 People to buy their own “simon” and invest more than 650.000 Euros. Find out everything about “Simon” the mini power Station! https://www.crowdfundport.eu/wp-content/uploads/2018/03/Simon.png 225 380 wpadmin https://www.crowdfundport.eu/wp-content/uploads/2019/01/cfp-logo-1.jpg wpadmin2018-03-27 14:51:412019-03-14 09:32:37Austria: "Everyone can generate electricity!"